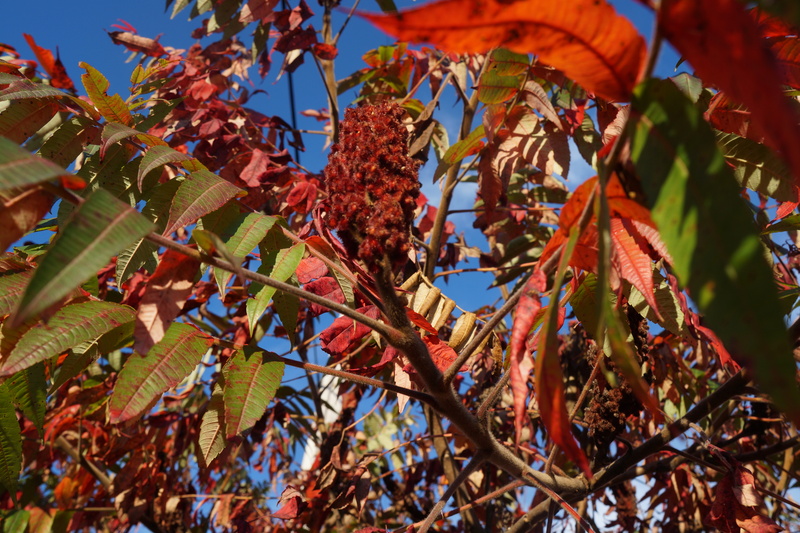 Staghorn Sumac: Is it Really Edible? For those of you who are familiar with the foraged ingredients I use, you will already be familiar with my use of sumac, in powder and liquid form. It is such a versatile flavouring, often replacing imported ingredients like lemon or pomegranate in sweet or savoury dishes. However, I continue to meet people who are very skeptical, if not terrified of using this fruit, so I thought it worthwhile to review my earlier posts and offer further information on the plant before I create any more recipes with it. The reluctance to try sumac is understandable. It is often paired with the word ‘poison’, as in ‘poison sumac’ which contains the same irritant as poison ivy, and we know how nasty that can be. I have not identified any poison sumac in this area, so have no photos to share, but the berries of the poison sumac are white, and the leaves are more oval in shape, with hairless stems. For some really good illustrations of the poison variety, visit this site. What is it? 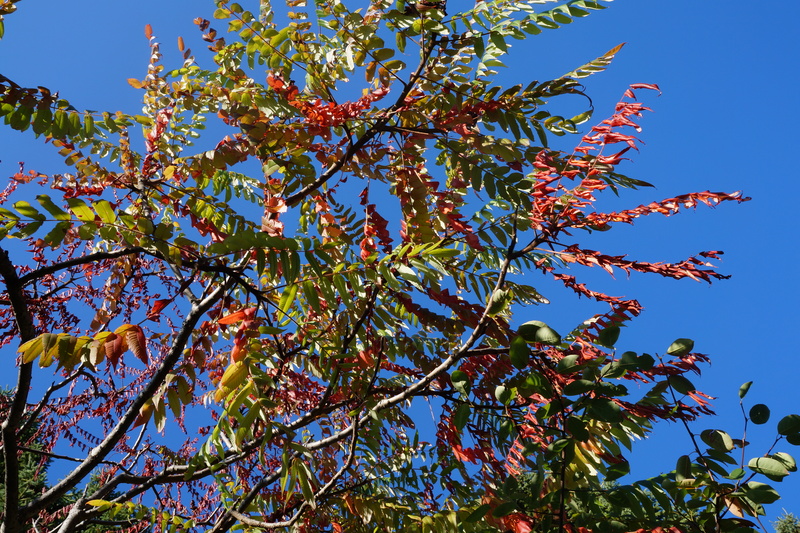 Rhus typhina, velvet or staghorn sumac of the Anacardiaceae family, to which mango, cashews and poison ivy all belong. It is a shrub which can grow to several metres in height. Where does it grow? Native to the northeastern part of North America, it is found in open places, along roadsides, edges of forests, and often in my flower garden. There are other ‘rhus’ varieties, all with red flowers, and all edible. If you do not have staghorn sumac in your area, you might have one of these other rhuses which might be worth investigating. How to identify it: Its distinctive soft velvety stalks, which give it its name, distinguish it before the berries appear. The berries, which ripen in late summer and fall are a deep red which makes it stand out. For some beautiful photos of this plant at all stages of its life, see this site, and you will have little difficulty identifying it when you come across it. When to pick it: As soon as the berries turn a dark red in the late summer, the entire cluster can be snapped or cut off. They can be picked right into winter, but the colour is not as brilliant. Do not pick it shortly after a rainfall, as the rain washes off the malic acid, which is what gives them their tart flavour. How to preserve it: Scrape the berries off without washing, and cover with water. Some directions say to put them in room temperature water, and allow to sit in the sun to make a tea or lemonade – others say to put them in hot water. I have simmered them to get out the maximum flavour, but you should avoid boiling as this can cause it to be bitter because it releases the tannic acid. Strain the liquid through a cloth to remove any of the little hairs. Alternatively, the scraped off berries can be dried, chopped in a blender or food processor and strained through a fine sieve for a powder. What to do with it: Many Middle Eastern recipes call for sumac powder, and this North American variety is indistinguishable in flavour. The tea concoction can be taken just as is, possibly with sweetener added. The tea can be made more concentrated too, and then used like a pomegranate molasses. 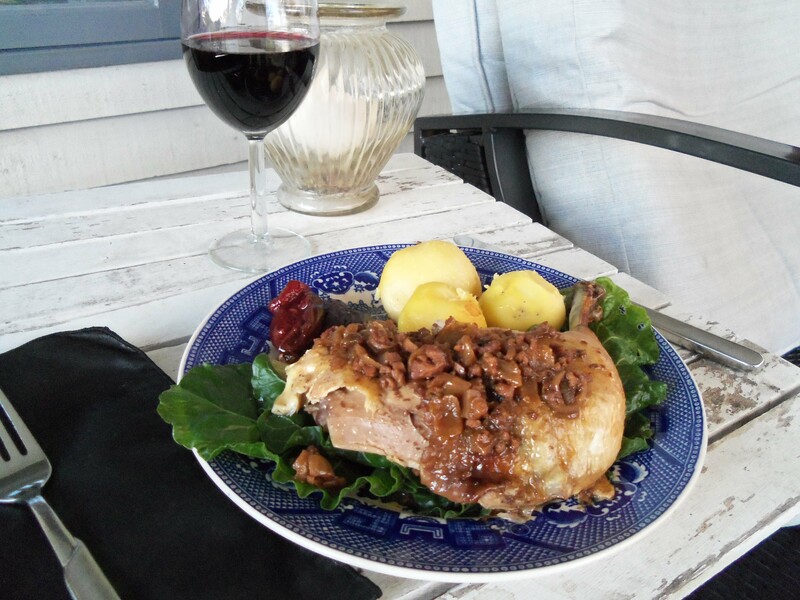 Here are some of my favourite recipes using sumac. 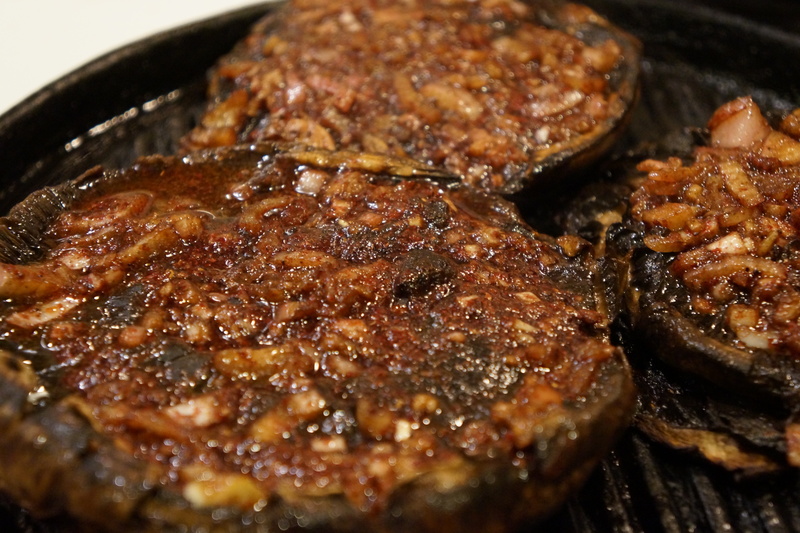 Fesenjun, a Persian dish traditionally made with chicken (or meat) in a pomegranate and walnut sauce. 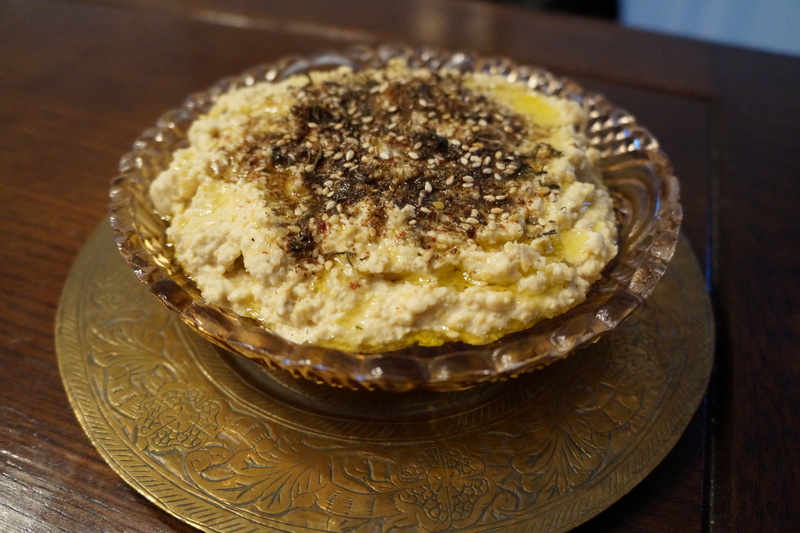 Za’atar, a mixture of herbs, seeds and sumac used in Middle Eastern cuisine. So now that sumac season is upon us, I look forward to finding some new recipes to share. In the meantime, I hope I have removed some of the scare factor from this versatile, tasty and plentiful ingredient. If you have any recipes to add, I would love to hear about them. Categories: edible weeds, main dish, recipes, wild fruit | Tags: cooking with sumac, edible sumac, poison sumac, preserving sumac, staghorn sumac, sumac berries | Permalink. Intrigued with the pie Hilda. Was it tart like lemon? I love sumac dried but have never used it in other forms. 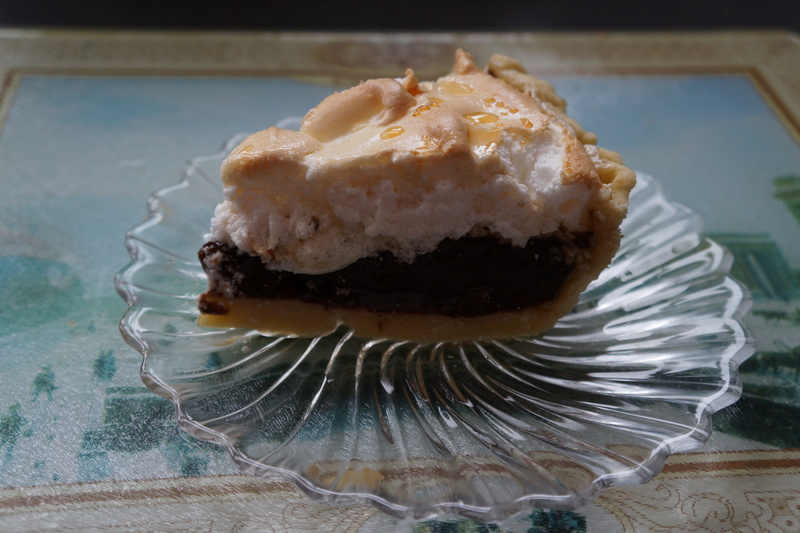 I guess you are in pie mode! The sumac is not as tart as the lemon, but then it doesn’t need as much sweetening either. It has quite a delicate taste, which is why I used such a concentrated juice – probably losing the vitamin c in the process, but the same can be said for lemons. I like it because while it is a good substitute for the lemon, it is something that is truly local. I have thought of mixing it with something else, but don’t want to lose out on that wonderful garnet colour. Thanks Hilda, so interested to see what fall and winter yield over in your grapevine of the woods! Probably just snow. I might have to migrate for part of the winter and find better foraging grounds. Thanks. I would think you might have staghorn in your area. thanks for this.. I use the powder.. yet there is a shrub near a store i go to that i have been looking at for ages.. I reckon its staghorn sumac.. your pics may have just confirmed it! Thanks! So glad to be of help. Be sure to look for the fuzzy branches if it is staghorn, but if it is sumac, and the berries are red, you might want to find out what type it is. Red berries mean not poisonous, but not always edible. Hang on ! So not all types are edible ? All types with the red berries are edible from what I’ve read, but there are many varieties, and they have different tastes. The poison sumac has white flowers. What I tried is called staghorn sumac, which is native to NA, but has been taken to some other parts of the world. There are also similar varieties elsewhere but I am not familiar with them. So, check the berries first, then the stems and leaves. If they are really staghorn sumac, the berries will have a pleasant lemony flavour. Hope that helps. Ok! Will let you know! If there are no posts over the next few days! Call lassie! Wonderful tutorial on sumac! Love it. I have tons of staghorn sumac. Actually will be cutting them down soon, so highly invasive! They look pretty, though. I wouldn’t mind if I had acreage. Thanks for all the ideas, Hilda! They are invasive – I probably pull hundreds of little ones out of my flower garden every year. However, I have left one, very pretty one, which I keep meticulously pruned. It gives nice dappled shade to my garden, and is a great favourite with the birds. So you might want to spare just one. Going to collect some on my dog walk – immediately following sending this! I’ve never known what sumac was, and I don’t know how prevalent it is in Australia. I’ll keep my eyes open now you’ve enlightened me!